January 5-12, 2019 One week in Huntsville, AL. As we crossed the Alabama border we played ‘Sweet Home Alabama’ and I must admit I had a tear in my eye because we are slow close to home! It looks and smells like home. As soon as we arrived at the RV park the girls got out and said the same exact thing. We stayed at Space Camp RV park right next to the US Space and Rocket Center. We chose this spot knowing we were just going to spend the entire week visiting the center. And we did just that! 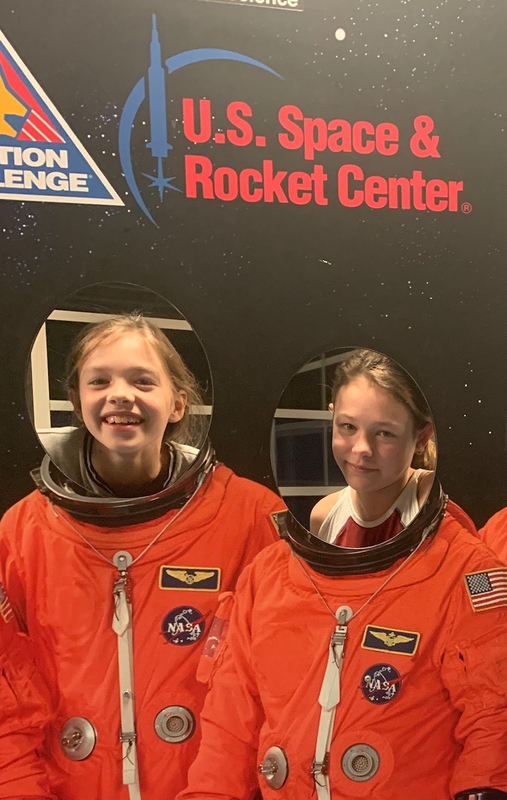 Mackenzie wants to attend Space Camp but she can’t until the summer of 2020 when she’s 12 because of our trip so I made a mini Space Camp for her this week. We loved our large spot and backed in right next to the rocket launching field. We rode our bikes to the center the first 4 days but then the last two days it was 35 degrees and windy so we drove. Thanks to our ASTC membership we were able to get in everyday for FREE! It cost $25 per person per day so we saved a ton of money! The only thing that is not included in the ticket price is the bus tour out to Marshall Space Flight Center. That 2 1/2 hour tour cost $20 each. The 3D movies (they offer 3 different ones- we watched Space Next) also cost an additional $8 per person. But the rock wall and three simulators are included. The courtyard of the center has two rides, the Moon shot and G Force Accelerator . The Moon shot was my favorite because we were shot up with launch like 4 G’s and then felt weightlessness for 2.5 seconds. The G Force 3 g’s for an extended amount of time with a centrifuged action- I sat that one out. A replica of Saturn I and V sit outside and are being repainted for the first time in preparation for the 50th anniversary of the Apollo 11 flight. We are even more inspired by space exploration after visiting this site. We are heading to the Moon when we are done our trip. We just need to play the lottery to reserve our tickets. The Davidson Center was built to house the third Saturn V test vehicle in the US and highlight the Apollo program. We’ve seen the other two at the other space centers. The ones that were used are in the bottom of the ocean or in space as space junk. There are efforts to recover them now. Inside this building they have the only piece of the original space station, SkyLab, that was recovered in Australia. We took the one hour guided tour they offer and highly recommend it. This building also has a moon rock (can’t touch) and Apollo 16’s command module is on display. The model of the new SLS is also on display. Inside main building we attended two live demo’s where we learned about parachuting and sensory deprivation. We each did two rock wall climbs a day. We throughly enjoyed the ISS exhibit where we were able to explore two of the model capsules. We challenged ourselves to make rovers in the Spark lab and loved the temporary droid/alien exhibit. Oh and we rode the Hyper ship simulator 4 times with a different video each time. We took the bus out to the Redstone and MSFC facilities, including stops at Historic Test Stands and the Propulsion Research and Development Laboratory. The highlight was getting to see the live feed of the astronauts in the ISS. One afternoon Mackenzie and I went Geocaching and shopping. We found the finest Geocache to date. To enhance our Space exploration lessons we watched Space Camp, October Sky and a documentary called Mercury 13 on Netflix. We also went to a nice theater, with the best leather reclining chairs we’ve experienced, to watch Aquaman. One night we took the girls to their first Top Golf experience. It’s been to cold to hit balls outside. We had a blast! Georgia on my mind. We are so excited to be heading home tomorrow for a few weeks to catch up with family, friends and doctors appointments.